The ColorPoint™ Telescoping Lopper is featured in the July issue of 'O' List - Just in time for Father's Day! Made with SK5 Heat Treated Steel Blades and aluminum handles that are heavy-duty with a lightweight feel, the ColorPoint™ Telescoping Lopper is perfect for the bigger cutting tasks. Easily extends from 24" to 31" with a simple twist of the wrist and has a click lock mechanism for safety. 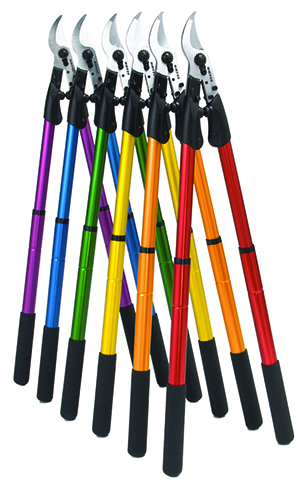 The ColorPoint™ Telescoping Lopper comes in 6 stylish and high visible colors: red, orange, yellow, green, blue and berry that will no longer get lost in the lawn. Dramm products are available at your local independent garden center such as Ace Hardware, True Value, and Do It Best stores. Also available on Amazon.com, use code OPRAH for 15 percent off, while supplies last.